Watching your health? The list of benefits of almond butter is long! That’s right. Just a simple change like adding delicious almond butter to your diet can make a change in your overall health. This ancient treat, technically the inside of the seed of the almond tree (much like apricots or peaches), is a popular ingredient in candy bars and baked treats. But the benefits of almond butter should make you reconsider reaching for that old staple of peanut butter for your toast or lunchtime sandwich. ● Almond butter is a good source of the healthy monounsaturated fats our bodies need. These fats are associated with lowering the risk of heart disease. ● Eating almonds offers antioxidant action from Vitamin E and helps lower cholesterol. ● A small serving of almond butter contains a generous amount of magnesium--which boosts heart health by promoting the blow of blood, oxygen, and nutrients--and potassium, important for good blood pressure and heart health. ● Eating almond butter helps keep blood sugar stable (unlike, for example, carbohydrates that may cause blood sugar to increase and crash). ● The low-glycemic index and protective antioxidants of almonds makes almond butter a wise choice for those at risk from diabetes because they don’t cause a sharp increase in blood sugar and insulin when consumed; and they even seem to help when you eat them along with foods that have a higher glycemic index. ● Consuming at least four servings of nuts – such as almond butter – a week reduces the risk of coronary heart disease by more than 35%. ● Almonds are power-packed! They are full of healthy flavonoids and Vitamin E.
● Studies show that eating just a handful of almonds or a few tablespoons of almond butter helps lower the risk of developing gallstones in women. ● Studies show that those who eat nuts (or nut butters!) regularly don’t tend to gain weight despite the high calories. Perhaps stable blood sugar and a diet based on protein rather than carbs is the reason. ● Almonds are a terrific source of the minerals manganese and copper as well as Vitamin B2, or riboflavin, all of which are necessary for energy production. It’s very easy to incorporate the benefits of almond butter into your diet. You can substitute almond butter for anything that calls for peanut butter – sandwiches, celery sticks, a few tablespoons in a smoothie, or on crackers. Power your body with the wealth of benefits of almond butter. 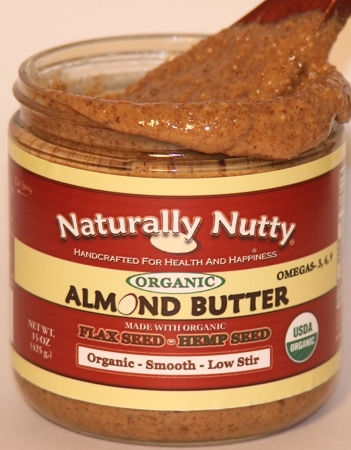 Check out our Naturally Nutty almond butters for delicious, quality almond butter made in fresh small batches.